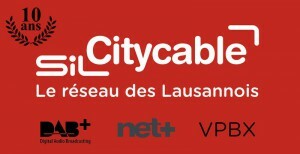 Citycable, the cable operator of the city of Lausanne in Switzerland, is completing its digital offer with more than 80 radio stations transmitted using DAB+ technology. It is the first known cable operator to use DAB+ on cable. DAB+ is usually used for terrestrial broadcasting but tests have shown that it works without problems on cable TV networks. Clear and interference free reception. Simplified installation, people just have to connect their receiver and scan. No need to know the frequencies anymore. Compared to Internet radio there’s no bandwidth consumption of the home Internet access, less risk of cuts or dropouts. In the longer term, FM could also be switched off on cable networks and frequencies re-used for increasing Internet service upload capacity. Citycable has partnered with the Opendigitalradio organisation for the integration of the DAB+ solution. It uses the ODR-mmbTools free and open source software and works on the same principle than what is used to broadcast local DAB+ stations in Switzerland. Citycable had specific technical needs and also wanted to keep the installation compact and cost efficient. The service can be received in Lausanne on channels 5A, 5B, 5C, 5D and in the future also partner cable TV operators in Vaud county.